Sometimes it seems like most cute food for kids is usually loaded with sugar, so when I find something that’s not, I’m all over it. 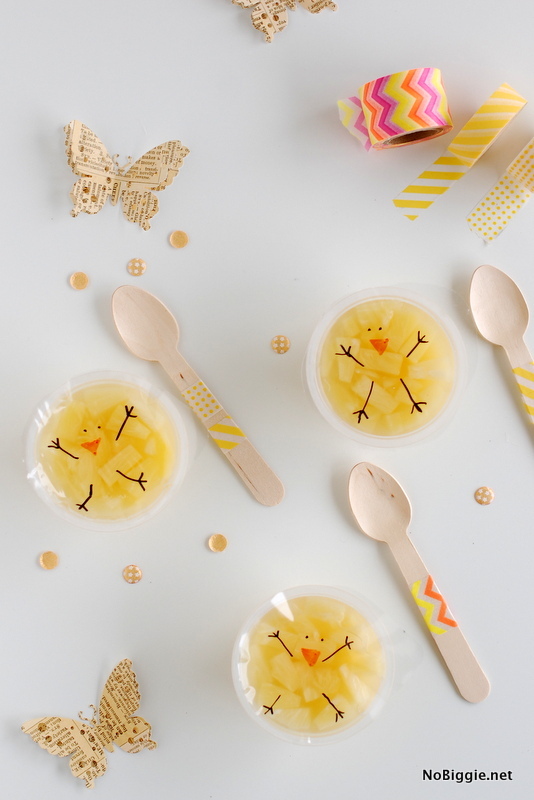 These little snack cups would be so fun for a Spring or Easter party. I’ve searched high and low for the original source for this fun idea with no luck. This is not my original idea, but I had to share the cuteness with you. When I first opened up these little Dole brand snack cups from their packaging, I was disappointed to find the expiration dates printed right on top of the clear plastic, making the little chick, not as cute. 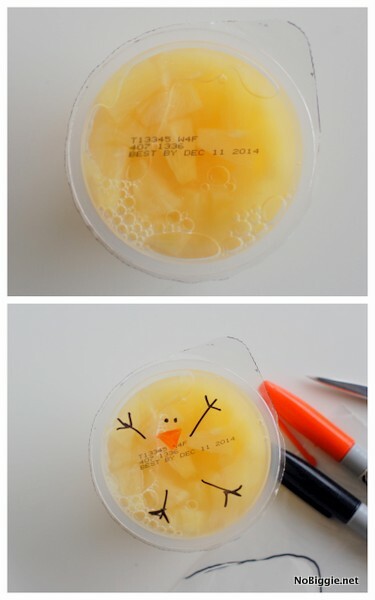 You might find a different brand of fruit snack cups without the expiration date right on top like this, but if not, here’s what you can do. 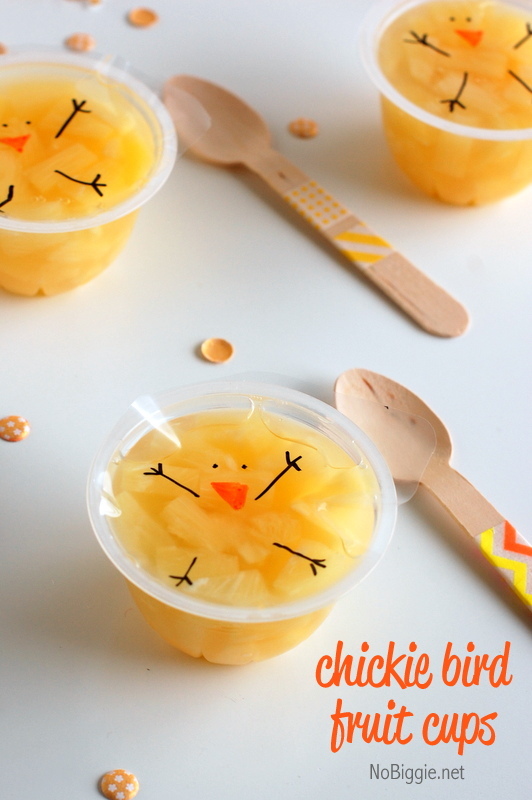 If you’re packing these up for your child’s lunch to take to school, then I say just add the cute chick right onto the expiration date and it’s the thought that counts. OR if you’d like to use this idea for a party you could try this: Flip the snack cups upside down and trace around the plastic top onto a clear snack baggie. Then just cut out a piece of plastic from the snack baggie and draw the chick on this new piece of plastic. 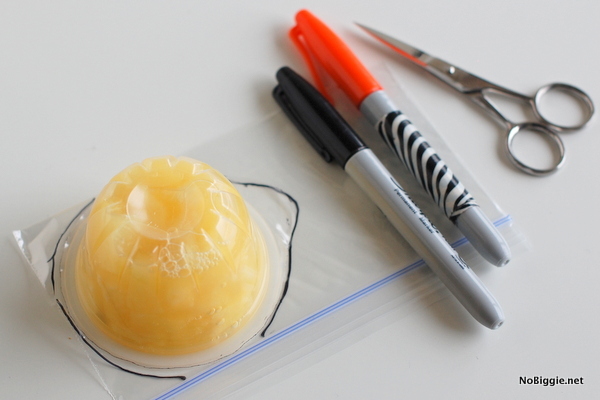 Take the plastic tops (with the expiration dates) off of the snack cups and replace with the new plastic over the top. 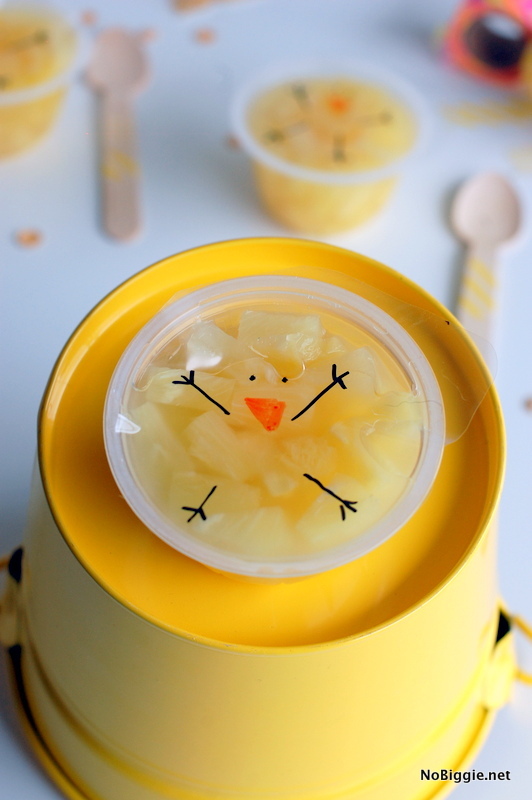 This might actually be a good idea for little ones that need mom’s help to open up these snack cups, anyway. Now you’ve done the work for them. …So you have some options. Either way, they’re pretty cute. Fun for Easter, fun for Spring…fun for Everything. When it comes to healthy snacks, what’s a favorite at your house? Would your little ones go for these? Looking for more fun Easter ideas? You’ll have to check out all of our Easter Ideas.